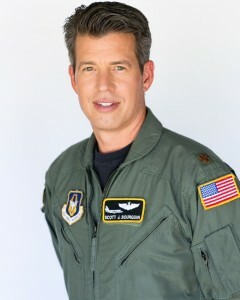 Scott Bourquin is a Decorated Combat pilot turned Entrepreneur, Speaker and Actor. During his military service, Scott served in several capacities beginning as a Security Police Team Member retiring 20 years later from the Air Force Reserves as a decorated Air Force Reserve KC-10 Instructor Pilot and Chief of Information Systems. Scott flew several tours in support of Operations Enduring Freedom and Iraqi Freedom and was selected to represent the Air Force Reserves at the 100th Anniversary of Flight Celebration at EAA AirVenture Oshkosh. When not flying in the Reserves, Scott was building several businesses. Scott is the author of a number of popular books listed on Amazon, to include: “So, Now What?” (2009) and “How to Market on Facebook for Free” (2012), which was followed in short succession by “How to Market on Google for Free” (2012). An Internet Marketing Authority & Keynote Speaker, Scott has delivered presentations and live training to audiences of up to 500. Scott’s work as an actor helps him to create more effective and engaging events as a speaker. In 2010 Scott and his wife returned home to Southern California to enjoy life by the ocean while running his business, working in the entertainment industry and continuing to write his Easy Guide Books.